Over the years, my desire to put Bibles in the hands of kids has caused me to purchase a whole host of Bibles. There was a period in which I gave out Five Minute Bibles left and right, hoping its shorter format would help students learn the narrative of Scripture and make them curious enough about it to pick up a full-length Bible and read more. Shortly thereafter, I started giving out Revolve Biblezines, hoping the slick magazine format would make teens more interested in Scripture. In both cases, I found Scripture somehow deficient; as though it needed my help to engage students. These days, I’m much more interested in finding a good, full-length Bible to put in the hands of students. In some ways, The Faithgirlz Backpack Bible: Follow Your Heart, NIV might be that Bible. •	It’s got a pink leathersoft cover that feels nice to hold onto. •	It’s simple and unadorned – important because tween girls can throw it into their backpack without fear of embarrassment if someone sees it. Since the only thing that say Holy Bible, is its spine, it also doesn't draw a lot of attention. •	It’s compact, which makes it a nice Bible to throw in a backpack or purse and take to church or youth group. •	Jesus’ words are in red, which makes it easy for tweens to know when he’s talking. •	It contains footnotes that reference quoted Scripture passages as well as explain archaic words. •	It contains no applications, which makes it appealing to a wider variety of people. Having said that, there are two things that would make me reluctant to put this Bible in the hands of a tween girl. 1. Although I think the Follow Your Heart on the Bible’s front cover is aesthetically appealing, as a youth pastor, it makes me nervous. Tweens are FULL of emotions. Their hearts are telling them to go in a hundred different directions and not all of those directions are good. What I want to teach tween girls to follow is Jesus – not necessarily their heart. 2. 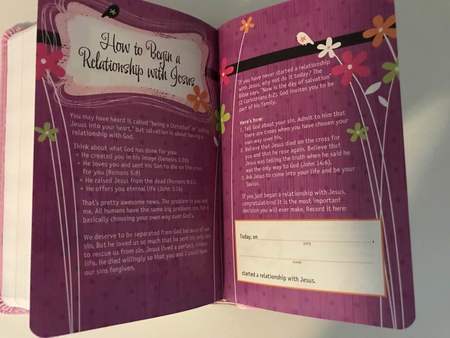 Additionally, two of the 12-full color pages are a spread on How to Begin a Relationship with Jesus. While I want tween girls to follow Jesus, I’m not sure doing so can be reduced to a one time event in which you follow a three-step process of admitting your sins, believing that Jesus died for you, and “asking Jesus to come into your life”. Life is more complicated than that – especially for tween girls. As a youth pastor, I want to celebrate not only when tweens first begin following Jesus, but also the ways in which they regularly follow him in their everyday, ordinary lives. All that to say… this one’s a mixed bag for me. The Faithgirlz Backpack Bible: Follow Your Heart, NIV certainly won't be for everyone. But some tweens (and their youth pastors!) will love it! If you, or a tween that you know, would love The Faithgirlz Backpack Bible: Follow Your Heart, NIV, then comment below. What do you look for in a Bible? A winner will be drawn on Oct. 4 from those who comment! Disclosure: I received a free copy of The Faithgirlz Backpack Bible: Follow Your Heart, NIV, from The Blog About Blogger Network in exchange for a fair and honest review.